The PADI Rescue Diver course, Challenging and worthwhile. This is the best description for the PADI Rescue Diver course. Building on what you have already learned, this course will focus on what you already know about how you prevent problems and what you do when they arise. The Rescue diver course from Vipdiveschool.com is well known for its content, we go deep into possible problems and you learn to deal with all the problems known to us before, during and after diving. You learn to take responsibility in this area and how to deal with it. During this course you will be thoroughly trained to prevent or solve problems. On the mainland, under water and on the surface, you read this is not just a course .... this is a new adventure! The nice thing about this course is that you take on the challenge and get the hang of it. Most divers find this course very demanding but definitely worth it. When he is finished, many indicate that it is the best course they have ever done. The training actually consists of 5 'sessions'. You can do a maximum of 3 sessions a day, which makes it possible to become Rescue diver within two days (!). We hold 4 days .... because diving has to stay nice and from this course ... YOU will really get tired! even the toughest men are amazed by the energy that this course "eats"! * Submit a copy of your PADI Advanced Open Water certificate or equivalent certificate. * Submit a copy of your logbook with which you demonstrate that you have made at least 20 dives. * Hand in a copy of your EFR certificate that you have obtained / renewed within the last 12 months. * Have submitted repeat requests from the PADI Rescue Diver manual in writing. * The written exam with good result so at least 75% of the answers have answered correctly. * All 12 have successfully completed the outdoor water exercises. * Bring a good mood to the waterfront. * Successfully complete scenario day. Number of dives: For the PADI Rescue Diver course we make many dives! 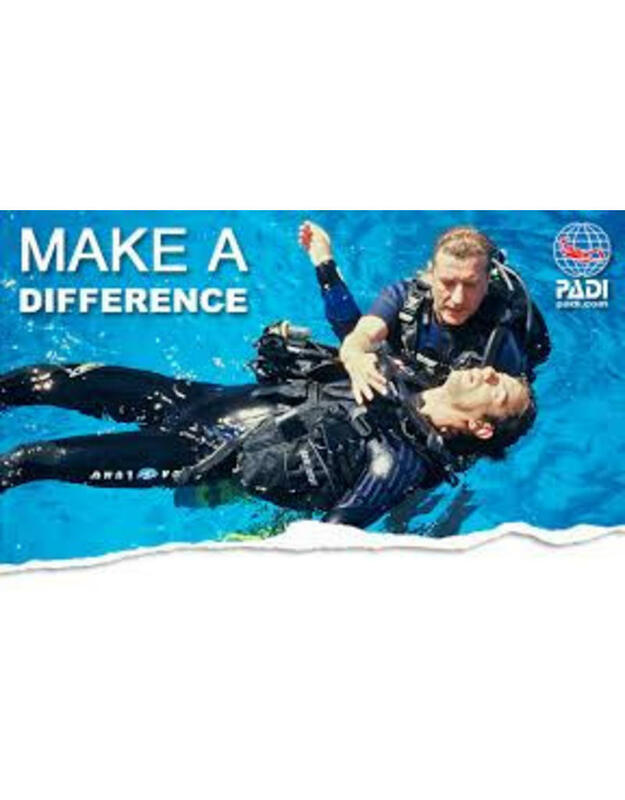 The PADI Rescue Diver course can be followed at our diving school in Vinkeveen and Almere 7 days a week between 09:00 and 23:00 h. Call or email us directly to record your date or book directly online and we will contact you. to make an appointment when it suits you! Diving equipment: During the PADI Rescue Diver course you use Your own diving equipment or You can rent the necessary diving equipment with us!